You look beautiful in this outfit! That is such a gorgeous floral skirt, Anna. I love the pumps and all of the rings and bracelets also. Your posts have been so fun, girly and full of Valentine's inspirations this week. I love them. Thanks for always showing us gorgeous ways to dress. Enjoy Valentine's Week! <3 Ada. Skirt is amazing. I like this lady like look. OMG. This outfit is everything. Gorgeous skirt! Love the print! Loving that backpack, so cute! I cannot believe there is a backpack that can be sophisticated. Awesome. Have honestly been thinking about investing in a backpack - they are no longer dorky, mommy wear! So chic! Love that skirt!! So pretty. This is just too lovely! Loving that backpack, definitely sophisticated. I also am madly in love with that ring! It's such a statement piece! Great skirt! I love the varying hues of blue. Lovely look! 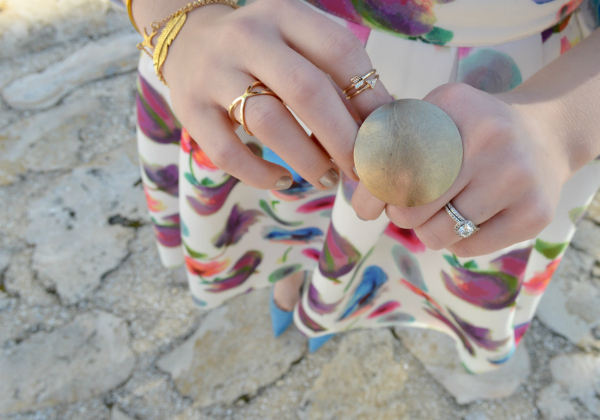 Loving your colorful skirt and those gorgeous pumps! I am just loving your colorful skirt! Reminds me so much of Spring! Awesome outfit! Love all the gorgeous colors! 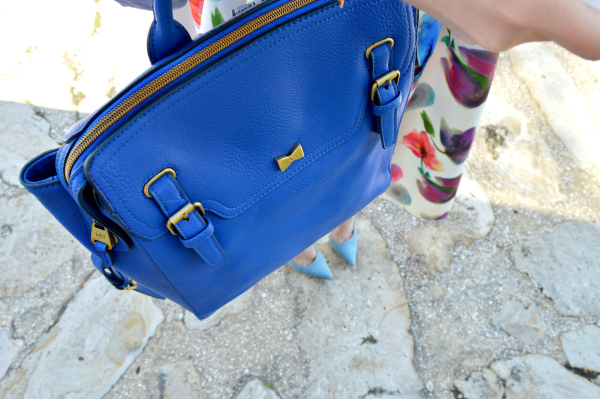 That bag is a gorgeous color, I love the twist from a traditional backpack! Modcloth always has great accessories. Oh my goodness, how perfect is this look on you!??!!??! I'm in love with that skirt and the blues! I love how you kept it simple with the button down shirt. You look absolutely adorable!!! This skirt! It's to-die-for! Totally in love. Is that a pearl bracelet? I love it. ps. i love this location. Very summer/spring. I always love your outfits because they're verygirly and ladylike. But this one is one my favorites, the skirt is very beautiful. I love this skirt! So glamorous! I keep seeing these backpacks popping up. Love it! I normally wouldn't see myself wearing a backpack but you have me thinking otherwise. I love this structured and polished looking version. And the color is perfect for spring. This skirt is amazing! Love that location, makes me want to take a trip!! Such a cute outfit! I am loving that skirt and backpack purse! The blue color is so pretty! 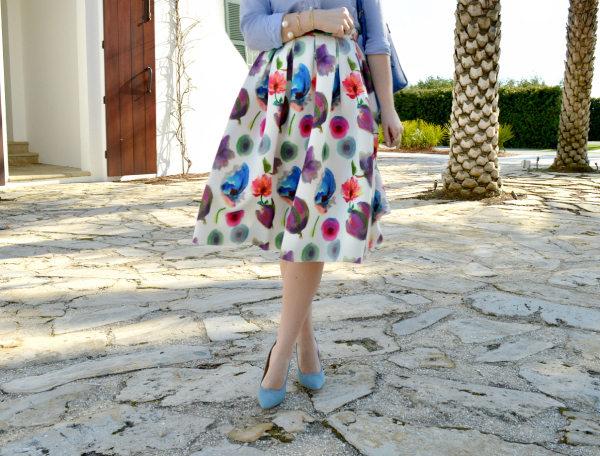 I love this floral skirt. It's the perfect ladylike length. So pretty Anna, I love the color of the bag! I love this look so much! The colours are beautiful! Love your pictures and the skirt! Any photography tips please? Your photographs made me glad . Much thanks for shared such fashionable dresses and her stylist photos .